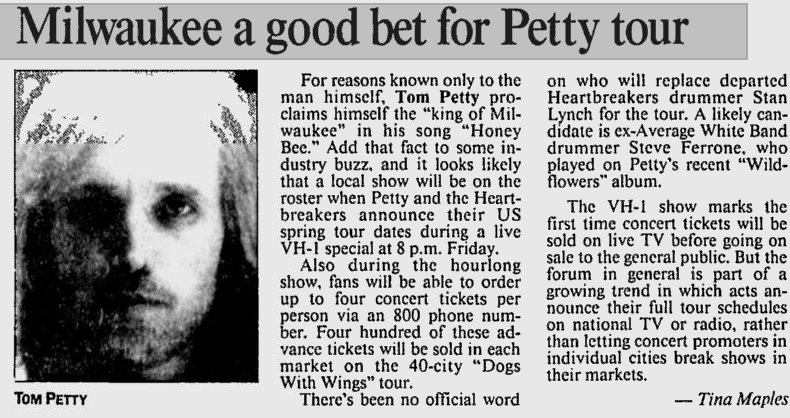 For reasons known only to the man himself, Tom Petty proclaims himself the "king of Milwaukee" in his song "Honey Bee." 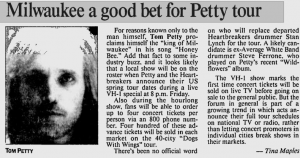 Add that fact to some industry buss, and it looks likely that a local show will be on the roster when Petty and the Heartbreakers announce their US spring tour dates during a live VH-1 special at 8 p.m. Friday. Also during the hourlong show, fans will be able to order up to four concert tickets per person via an 800 phone number. Four hundred of these advance tickets will be sold in each market on the 40-city "Dogs With Wings" tour. There's been no official word on who will replace departed Heartbreakers drummer Stan Lynch for the tour. A likely candidate is ex-Average White Band drummer Steve Ferrone, who played on Petty's recent "Wildflowers" album. The VH-1 show marks the first time concert tickets will be sold on live TV before going on sale to the general public. But the forum in general is part of a growing trend in which acts announce their full tour schedules on national TV or radio, rather than letting concert promoters in individual cities break shows in their markets.